/sa•yaw/ explores the rawness of people’s everyday movement as a form of expression. Through dance vignettes and personal interviews, this project will look at dance from the lens of the masses. The production strives to showcase everyday movement into dance. It shows the importance of every students body movement. Each movement becomes a dance step and each movement makes a story. These movements will eventually contribute largely to an individual's spirituality most especially in their chosen path. /sa•yaw/ also aims to promote professionalism through the different qualities and behaviors that the performers practice throughout the entire production. Most importantly, /sa•yaw/ will have the audience members rethink their actions, for all their actions have meaning. /sa•yaw/ is directed by Ani ng Dangal awardee, Olivia Bugayong. Olivia started dancing at the age of 4 in Vella Damian School of Ballet. As of now she has participated and won some prestigious competition locally and internationally namely, Philippine Dance Cup 2016, Hong Kong Challenge Cup Dance Competition, and Malaysian International Ballet Grand Prix. 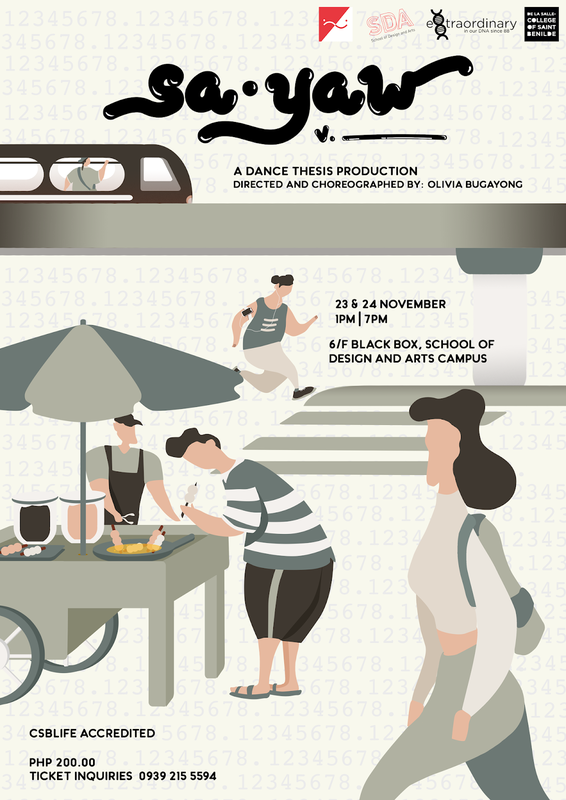 This production will also showcase performances by Ani ng Dangal awardee and HKCCDC 2016 best performance - Neil Casagan, two-time Hong Kong Dance Cup gold medalists - Kul Dela Torre and Mark Juelar, and a graduate of Philippine High School for the Arts and senior member of Saint Benilde Romancon Dance Company - Tonjie Mangao.